PWN Norway’s event "SDG -Shifting Diversity Gear“ at Oslo Innovation Week 2018 is over, but I still get a bit high when thinking of it. For those of you who weren't able to attend, we thought you'd like to read some of the great highlights. While technological innovation is enabling cars to drive autonomously, social innovation is a vehicle that needs to be steered by humans. My takeaway from the event is that we really are waking up to take matters into our own hands and to shift diversity gears. It was a delight to have a fantastic group of speakers and panelists on stage, those sitting in the driver’s seat, the stakeholders in international organizations, politics, academia, business and communities. They are the ones fuelling our diversity vehicle with human centred innovation and positive disruption and equip society with a roadmap towards achieving the 17 Sustainable Development Goals. THE THING TO DO when you get around 150 people together, who do not know each other, is to break the ice. With the fabulous facilitation of Bjorn Z. Ekelund, we all took the Diversity Icebreaker test, finding out whether we rather fit into the BLUE, GREEN or RED category, depending on how structured, creative, analytical, empathetic, team-oriented or innovative we are. The ice was broken and it was time for our President, Alicia Partee, to send us on the journey to diversity and inclusion by using the analogy of Pythagoras’ 5th hammer and creating harmony. But what is needed and how can we achieve harmony in today’s society? How about Cryptowomen, who started shifting gears in the world of technology? Marianne Haahr showed us how Blockchain is establishing a whole new economy creating the opportunity to start out in a different gear. Getting more women involved in new technologies such as Blockchain at an early stage is crucial. In her opinion pupils should be given the option of choosing Java, Python or C++ as a new language in addition to choosing French or Spanish. She adds that this is necessary to achieve a real break through! This certainly made me think that we may have been too focused on letter based languages and thus neglected number based languages in education. How about an equal pay law? Þorsteinn Víglundsson made unequal pay illegal in Iceland. He criticises that what we have been doing so far has clearly not worked. We still have not managed to close the pay gap. However, he also addressed a different aspect: "Men live longer in gender-balanced societies. So if for no other reason than this purely selfish one, men should seek gender equality". During the panel discussion, the speakers were joined by Birgit Liodden from Oslo Business Region, who joined us straight from her interview with Barack Obama, Malak Al Akiely from Jordan, Morten Sonniks from IMDI, and Mari Teigen representing academia.They all shared incredibly inspiring stories: Malak, for instance, told us about her experience with getting Jordanian women in rural areas involved in beekeeping (Women BeeBuzzers), thus giving them a secondary or main source of income. Birgit reported about her experience with the first public #MeToo discussions in the shipping industry. Of course, THE QUOTA question was raised. At this pace, achieving 30% female representation on boards of directors would require at least 30 years. However, all share the same opinion, namely that we do not have this much time. The panellists agreed that there is always advantages and disadvantages to quotas. However, they said that there is actually no pipeline problem and the pool of outstanding leaders can be easily widened by appointing more female managers. Simply imposing a quota will not stop the marginalisation of women, but walking the walk and putting women on managing and supervisory boards will. Moreover, policies on parental leave and work re-entry programs for both men and women should be in place to avoid potential pitfalls and help smooth out the process. All in all, we got the feeling that harmony sets in when we start with human dignity and see diversity as an added value. Then we can shift that gear in our societies. 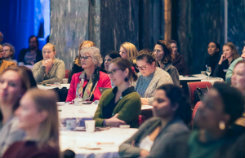 We hope to see you at PWN Norway’s event at OIW 2019!